This week hasn’t been too great If I’m honest. So I’ve been find ways of turning down days into up days. My pain levels have been high & I keep losing my balance. I’m trying my best to stay positive and just rest but sometimes it’s difficult as I explained here. I guess there are always going to be bad day’s & I just need to fill those days doing something easy and simple to stop focusing on the pain. So I decided to do just that and busy myself with something & ended up finishing off knitting Izzy’s red scarf I started before Christmas & forgot to pick back up again. I finished off the scarf quite quickly and decided to make a start on learning how to crochet using this Youtube video. The first thing I decided to try crocheting was a simple flower. At first it looked complicated & I thought Id never get the hang of it! Admittedly Izzy hopping on and off my lap didn’t help much at first but I managed to make my first crocheted flower. After that I felt quite confident I could make another without a video & managed to produce this second crocheted flower. I was much happier with this one and carried on making a few more..
Eva loved the flowers & asked me to make her a headband with a flower on. ( Just happened to be the wonkiest one!) So I gave it a go and this is how it turned out..
I’m quite pleased with how it turned out even if Eva did choose the wonkiest flower I’ve made (haha). 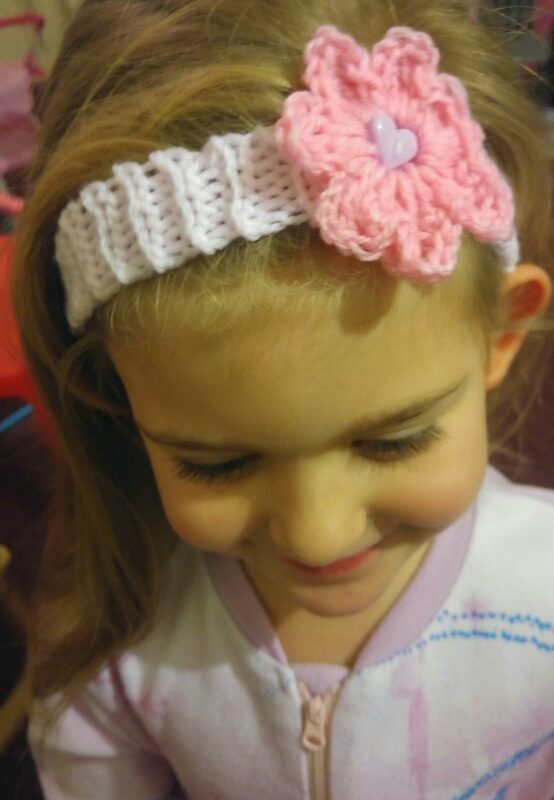 I have really enjoyed learning too, I’m going to make Izzy a headband next and I want to learn to crochet hearts next too. Thank you :) haha only for the naughtiest bear I know!